So go and make followers of all people in the world. Baptize them in the name of the Father and the Son and the Holy Spirit. Teach them to obey everything that I have taught you, and I will be with you always, even until the end of this age. Everyone, including children, has a sinful nature and is therefore in need of salvation. God instructed the Israelite's to pass on their legacy of faith to their children. That same instruction applies to us as well. 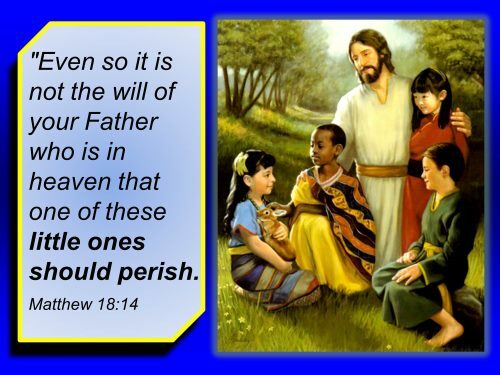 Jesus specifically instructed his disciples not to turn children away. pronounces a stinging curse an anyone who offends a child who believes on Him. 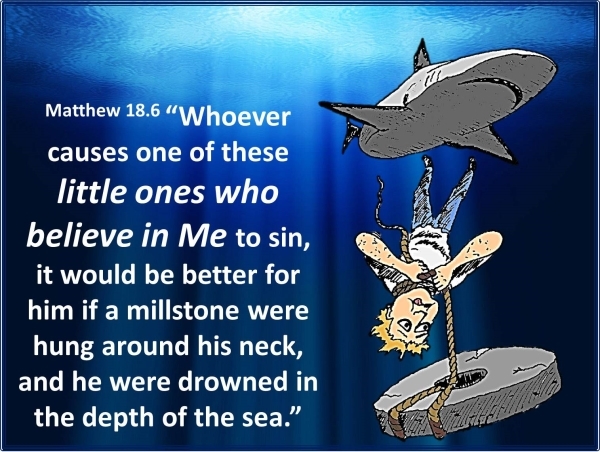 He considers it possible for little ones "to believe in Me" (v.6). In Mark 10:14, which G. Campbell Morgan described as the "Magna Charta of Children,"
"Suffer the little children to come unto Me, and forbid them not: for such is the kingdom of God." Jesus also qualifies what children should come. Two major Greek words, teknon and paidon, are translated "child". Teknon simply means child or youth. Paidon signifies a very little or young child, or even a newborn infant (as in John 16:21). Here in Mark, the Lord used the word paidon: "Suffer the little children (i.e., even the very small children) to come unto Me." Fathers are given a mandate to bring up their children, "in the nurture and admonition of the Lord" (Eph. 6:4). No one can be nurtured in the faith until first converted. Beyond these Biblical considerations, it is also an established fact that people are more receptive to the gospel while they are young. "A series of studies we conducted regarding the age at which people accept Christ as their Savior highlights the importance of having people invite Jesus into their hearts as their Savior when they are young. We discovered that the probability of someone embracing Jesus as his or her Savior was 32 percent for those between ages of 5 and 12; 4 percent for those in the 13- to 18-age range; and 6 percent for people 19 or older. In other words, if people do not embrace Jesus Christ as their Savior before they reach their teenage years, the chances of their doing so at all is slim. Though obvious but often overlooked, children are not as mature as adults. Every child is also different, each possessing different degrees of maturity and understanding. We therefore carefully endeavor to present the Gospel to them in such a way that they can understand.